An £83,000 donation is the first part of a generous promise that will help to fund nurses at Bluebell Wood Children’s Hospice for the next three years. The Matchroom Sport Charitable Foundation has pledged £250,000 over three years to help South Yorkshire’s only children’s hospice cover the costs of two nurses caring for children and young adults with life-shortening and life-threatening conditions. The Matchroom Foundation, which was launched in March 2017, centralises the charitable work of Matchroom Sport, the global sports promotion company headed by Barry Hearn and its subsidiaries, the Professional Darts Corporation, World Snooker and the PGA EuroPro Tour. 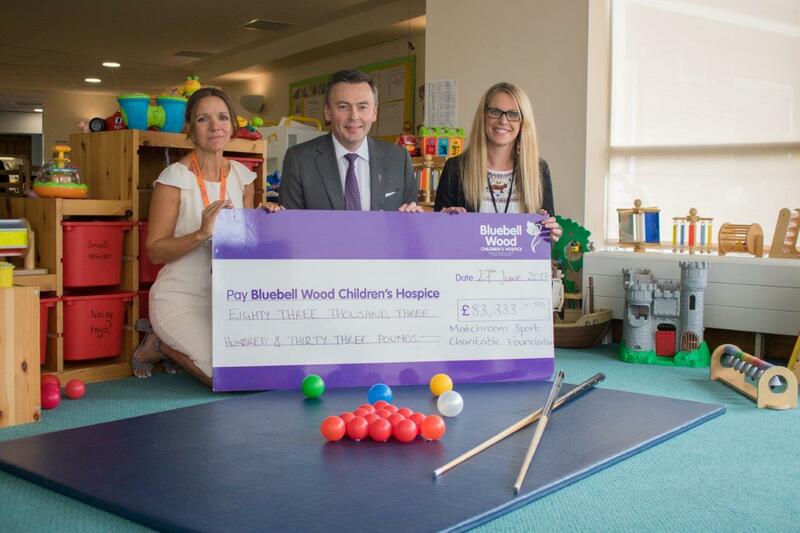 The new fundraising follows on from a partnership between World Snooker and Bluebell Wood over the last four years that has raised an incredible £297,998 for the charity. It costs more than £4m to keep Bluebell Wood’s doors open for families across South Yorkshire, North Derbyshire, North Nottinghamshire and parts of North Lincolnshire. To find out how you can help Bluebell Wood and the families they care for please visit www.bluebellwood.org.